Coconut sugar (also known as coco sugar, coconut palm sugar or coco sap sugar) is a sugar produced from the sap of cut flower buds of the coconut palm. Coconut sugar has been used as a traditional sweetener for thousands of years in the South and South-East Asian regions where the coconut palm is in abundant supply. The world's largest producers of coconuts are thePhilippinesand Indonesia. 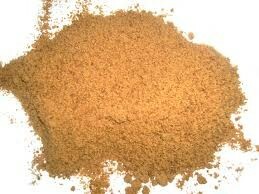 Coconut sugar is subtly sweet almost like brown sugar but with a slight hint of caramel. However, since organic coconut sugar is not highly processed, the colour, sweetness and flavour can vary depending on different factors. Coconut sugar's colour, sweetness and flavour can vary slightly from packaging to packaging depending on the coconut species used, season when it was harvested, where it was harvested and even the way the "sap" or "toddy" was reduced. Coconut sugar consists primarily of sucrose (containing glucose and fructose). Organic Coconut Palm Sugar is made from the sun-kissed sweet juice of the tropical coconut palm sugar blossoms. Once the nectar is collected, it is kettle-boiled into a thick caramel, dried, and ground into a fine crystallized powder. It is 100% organic, vegan, kosher, gluten-free, and sustainably-grown. Safe for diabetics and those looking for weight control. Contains vitamins and minerals such as potassium, magnesium, zinc, and iron, Palm Sugar really is the sweetest way to healthy lifestyle.